southernblondevegan – Live Kind. Eat Kind. I absolutely love making raw vegan desserts! When I first began creating my own recipes I had many, MANY failures. In fact for every recipe I loved there were at least 2-3 failed attempts (just ask my husband and appointed “taste tester”, poor guy). Over the past year of using these ingredients I’ve come to learn more about combining them – what works , what doesn’t, what’s too sweet, what’s bland etc. Now it’s fairly easy for me to get in my kitchen, see what we have one hand, and create something pretty delightful. Trust me when I tell you, these bad boys are pretty delightful! You could easily make this recipe one larger pie, but I like to make things mini size for my daughter. It’s just easier to portion things out that way, plus she thinks they’re cute! This particular recipe is so forgiving. In all honesty, I usually don’t ever measure out my recipes. I eyeball everything and taste test as I go. I think one of the best things about raw vegan desserts is you can munch on it as you make it – no raw eggs to worry about and it doesn’t have to be baked! So I encourage you to taste test along the way and make adjustments as you go. That’s the easiest way to ensure a recipe turns out the way YOU like it. Speaking of recipe, let’s get to it.. Blend all in your food processor until well combined. Press in the bottom of your lightly oiled cupcake pan. (I dabbed my finger in a bit of coconut oil and lined the bottom/sides). Freeze for 20 minutes . (very important that they are juicy and soft – using quality dates make all the difference! Blend all together until creamy, adding almond milk as needed to help blend. Fill tins and top with Vitacost cacao nibs. Freeze for 2 hours. I use a butter knife to loosen the sides and they pop right out. Let them set at room temp for 10 minutes and then enjoy! After they’ve been frozen and removed from their tins they can be stored in the fridge. I hope you all are having a great day!! 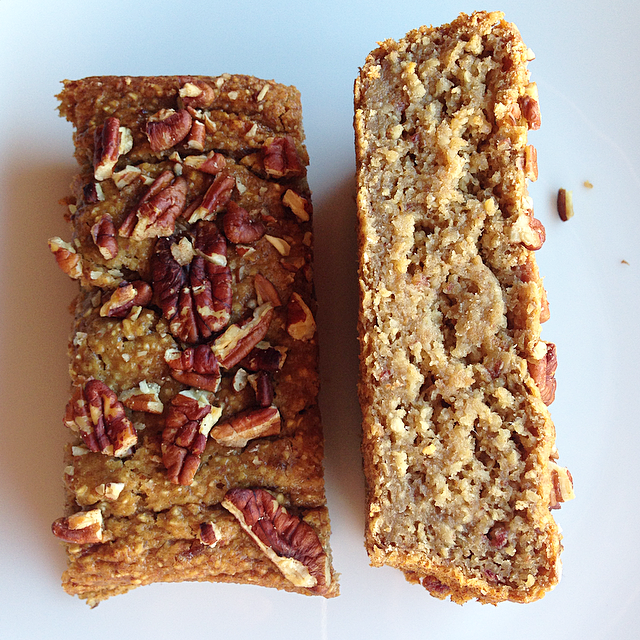 I love a good, dense, soft, sweet, banana bread (can I get an amen?). The entire process of making it is therapeutic to me! We had 6 big bushels of super ripe spotty bananas sitting on our counter, so I froze half for banana ice cream, saved a couple bushels to much on, and used the rest to bake up some goods for the week. I love all the different ways you can manipulate a simple banana to create so many wonderful, delicious treats! I wanted to come up with a recipe that was very low fat, no oil, no eggs/dairy of course, no refined sugars, but still FULL of flavor. I wanted something that tasted like dessert, that could also be eaten for breakfast. We finished the last of these off this morning and my husband is already begging me to make it again, which is always a good sign! These are not a typical bread you buy from the store – definitely not a light and fluffly, slightly dry, make a sandwich with it kind of bread. 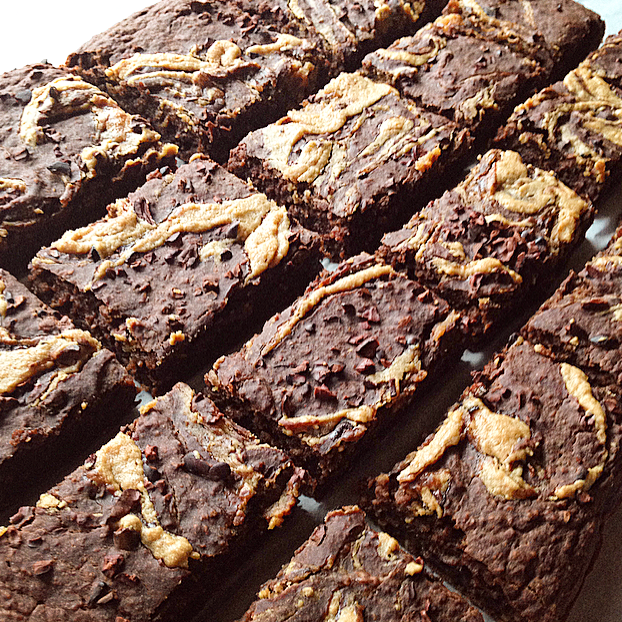 These are dense and moist, creamy and filling, sweet and almost brownie-like. My favorite. 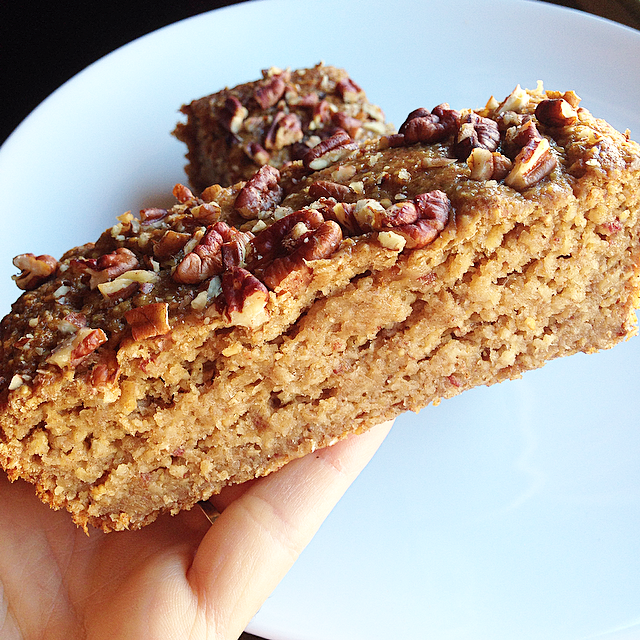 Give me a big mug of my vanilla caramel chai tea and a warm slice of this, and you have a pretty perfect start to a day! Mix first 4 ingredients well, then separately mix the rest of the ingredients in your food processor until completely smooth. Combine wet and dry and stir well. 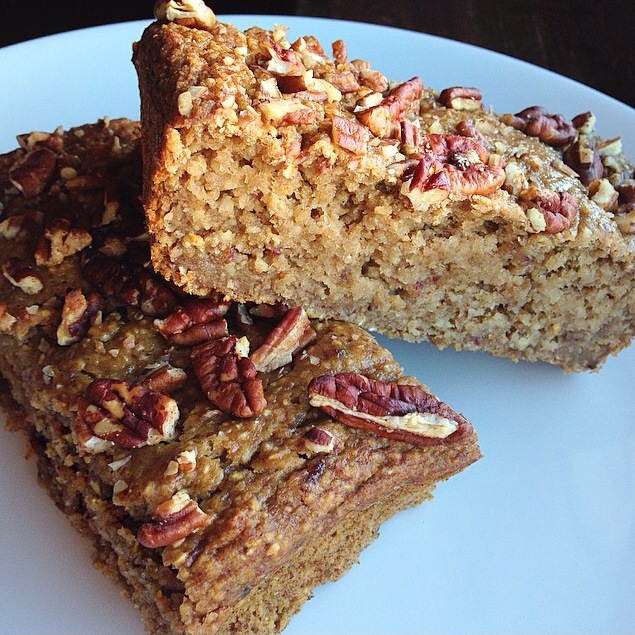 Pour into your baking pan and cover with your chopped pecans. Bake at 350F for 30-40 minutes or until toothpick comes out clean. Let set in the fridge for 30 minutes to firm up, then slice and serve. To store, I wrap them individually in paper towels and put them in ziplock baggies to store in the fridge. Trust me when I say, these only get better the second and third day (if they last that long, which in our home usually doesn’t happen!). We take them out and heat them up in their paper towel for 20-25 second/until warm in the microwave. I hope you try, hope you enjoy. Have a great day everyone!! I think cauliflower may be one of the most versatile vegetables available to us. We always have at least one head of fresh organic head of cauliflower in our fridge and 2-3 bags of frozen. I use it for sushi “rice”, steamed and pureed like mashed potatoes, in pizza crusts, roasted, raw dipped in hummus, and it even makes a great binder in some desserts. 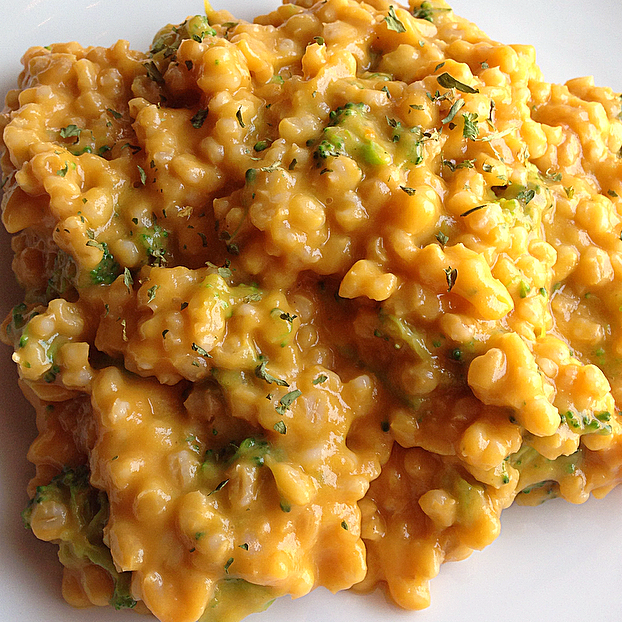 It has a mild flavor which makes it easily adaptable to all kinds of recipes! 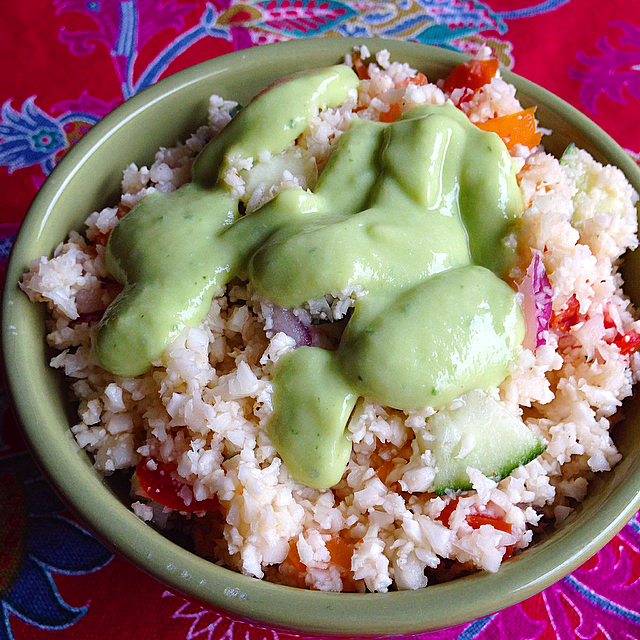 This is one of my favorite ways to enjoy cauliflower – raw, blended into “rice”. You can use it in burritos, salads, even fry it up in the skillet with some vegetables like fried rice. Today we’re going to keep it raw and throw in a ton of fresh raw vegetables to give it a great mix of flavor, then make a really creamy dressing to pair with it! Wash a dry your cauliflower, then chop and add to your food processor. Pulse until you have a fine rice consistency. Add all other ingredients and mix well. You can let it set in the fridge for a few hours if you want to let all the flavors combine – it’s better after it’s sat together. Blend well in a high speed blender. Store in an airtight container in the fridge. I prefer to mix this dressing into the salad and store it that way. This is a great salad to store in a container and take to work or school if you are needing to pack a lunch. It keep exceptionally well, and tastes even better the second a third day in the fridge! If you aren’t a fan of a particular ingredient I encourage you to experiment with flavors your do enjoy! These recipes are so easy to adapt, so please don’t ever feel like you must go 100% off someone else’s ingredient list. It’s pancake Sunday in our house, which means this mama bear is busy in her kitchen experimenting with different ingredients trying to figure out the flavor of the week! This week, vanilla Maca and chocolate chip chai win by a mile. If you have a reluctant husband or child that is convinced healthy pancakes can’t possibly taste good I beg you to make these for them. It’s a game changer! 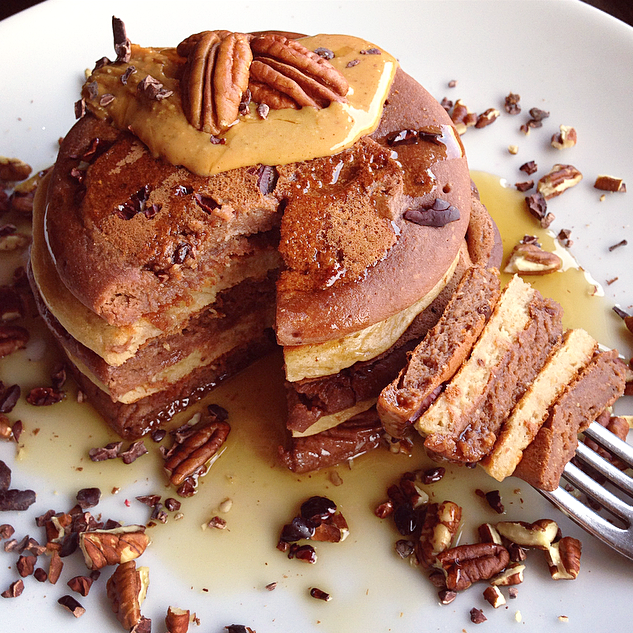 We topped with raw almond butter, pure maple, raw pecans, and cacao nibs. 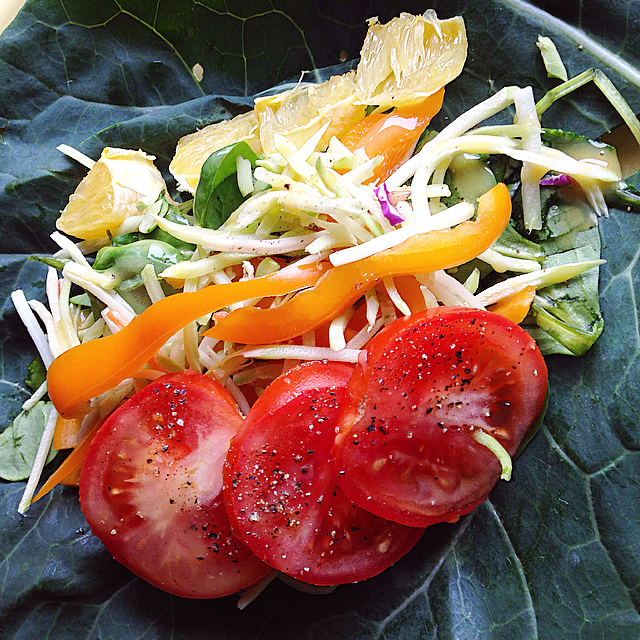 There are many days where I wake up craving dark leafy greens. I know this will sound a little bizarre to some, but if you’ve eaten a plant-based diet high in earthy green foods you know what I mean. Our bodies begin to crave the flavor, texture, and feeling they provide our cells with! If you are someone who is not crazy about dark greens just yet, these wraps are a great way to introduce them to your pallet. 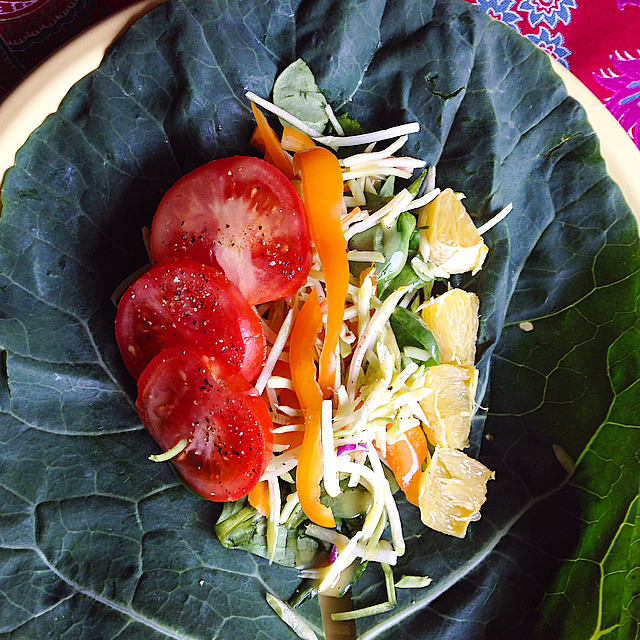 I’ve combined the raw leafy flavor of collard leaves and spinach with fresh raw vegetables and my favorite vegan fat free sweet Hawaiian ginger dressing. I’m such a burrito lover myself, so these are something I have often! 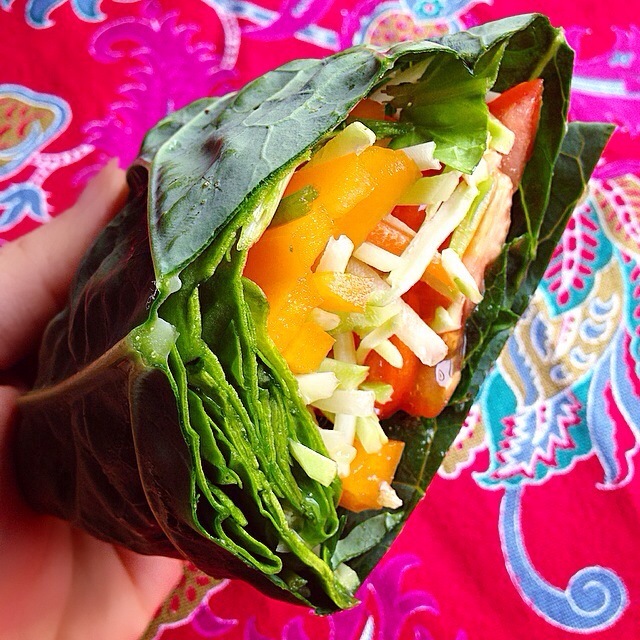 Fill your large leaves with your ingredients and wrap tight. Enjoy! These are awesome to pre-make and pack with you to take for a lunch at work or school. The collard leaves are strong and thick enough to hold up without getting completely soggy. I hope you try and enjoy. Have a beautiful day everyone!! Holy guacamole. 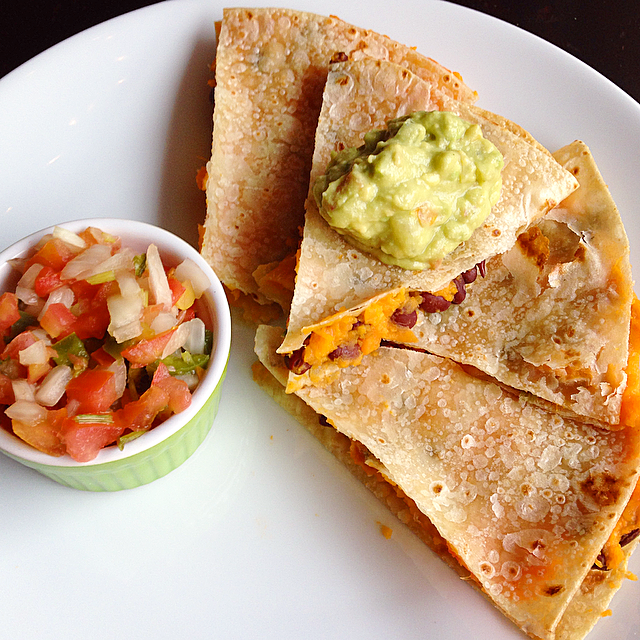 I think quesadillas should have their own food group. Since going plant-based vegan a few years ago this is the first time I’ve recreated them in a healthy animal-free way, and I have NO CLUE what took me so long! These are wholesome, filling, guilt-free, low-fat, PACKED with nutrients (sweet potatoes are one of the best foods you can possibly eat), and even better than I remember them being in restaurants. 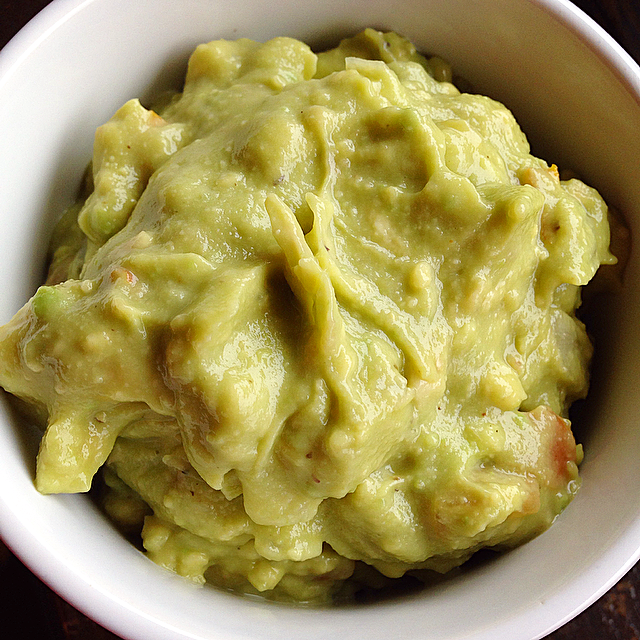 I will also add my really simple guacamole recipe, because it should be smothered on most everything – especially these! Preheat oven to 375F. In a skillet, cook minced garlic and onion on low for 3-5 minutes, then add black beans and cumin powder. Cook until beans are heated through. Skin your steamed sweet potato and mash half, then stir in your black beans, and all the other ingredients. 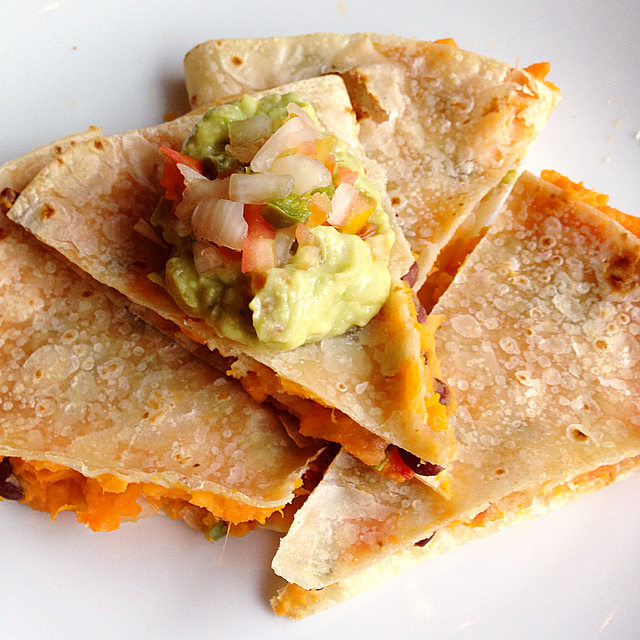 Spread the mixture on half of your tortilla then fold over the other half and bake for 8-10 minutes on each side. 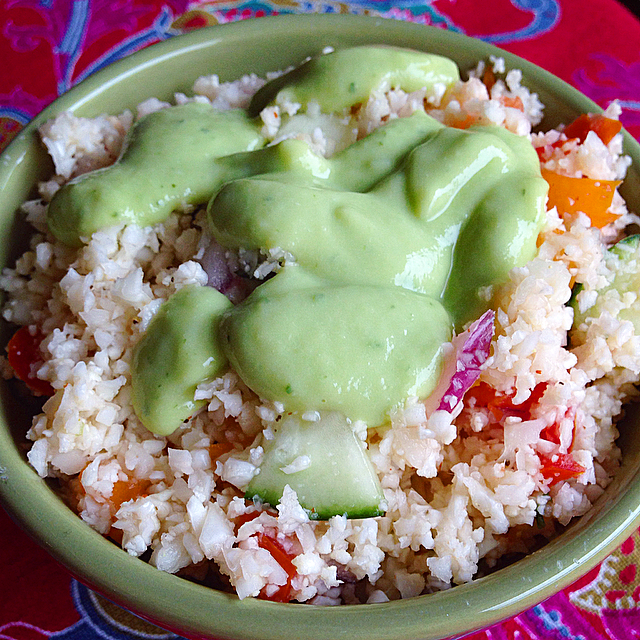 Serve with a big scoop of guacomole and fresh pico de gallo. Combine all and mash until you get your desired consistency. I like mine very creamy and easily spreadable, so I add a bit more lime juice as I go to get a creamier texture. Do what you like! This makes a small batch – double or triple to make more at once. It keeps well sealed in the fridge. I always have some pre-made to spread on toast, salads, fresh vegetables, or whatever else is laying around! Avocados are such an excellent source of healthy fats and this delicious side dish is full of great vitamins and nutrients for your body. If there are any of your favorite dishes you’d like to see “veganized” please comment them below! I always love a good challenge. Have a great week everyone!